China's phase-three planning for robotic lunar exploration is focused on returning to Earth samples from the moon. As China's Chang'e 3 lander and Yutu rover mission to the moon unfolds, the country's space authorities are pushing forward on their next stage of lunar progress — gathering select samples of the moon and rocketing them back to Earth. China plans to launch the unmanned sample-return mission, known as Chang'e 5, in 2017, signaling the third stage in the country's lunar exploration plans, officials said. As reported by China's state-run Xinhua news organization, Chang'e 4 is the backup probe for the Chang'e 3 mission, which successfully put a lander and rover down on the moon on Dec. 14. Chang'e 4 will be adapted to verify technologies for the sample-return initiative, which involves the Chang'e 5 and Chang'e 6 missions. 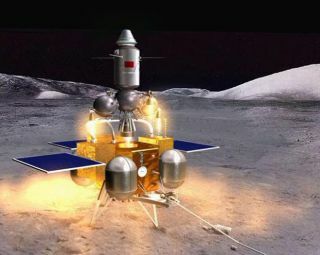 "The program's third phase will be more difficult because many breakthroughs must be made in key technologies, such as moon surface takeoff, sampling encapsulation, rendezvous and docking in lunar orbit, and high-speed Earth re-entry…which are all new to China," Wu said. Wu also said that in the next stage of the lunar program, there will be more international cooperation. "Despite current progress, China still lags behind space giants like the United States and Russia in many aspects," Wu said. "We need to work harder and move faster." Hardware associated with China's Chang'e 5 moon sample return program is tested in the Gobi desert. The state-run newspaper China Daily reported earlier this year that an experimental spacecraft will be launched before 2015 to conduct vital re-entry tests on a capsule design to be used in the Chang'e 5 mission. That work is apparently now underway within a Gobi desert test site. Engineers are apparently also using a rocket sled as part of a Chang'e 5 re-entry test program. The Chang'e 5 sample-return capsule would haul back the goods from the moon, plunging through Earth's atmosphere at a projected speed of about 25,000 mph (40,230 km/h). To date, no Chinese spacecraft has ever re-entered at that velocity, according to China Daily. Hu said that after Chang'e 5 enters lunar orbit, two modules would separate and land on the moon, with one collecting soil samples. Those specimens would be placed in an ascent module, which would blast off from the lunar surface and dock with the orbiting craft. The sample would then be transferred to the re-entry capsule for the trek back to Earth. The Chang'e 5 mission involves a "relay" approach, one that requires precision rendezvous and docking in lunar orbit, Hu said. Yan Jun, head of the National Astronomical Observatories of the Chinese Academy of Sciences and chief scientist of the lunar exploration program, said some lunar materials would be scooped up from the moon's surface, while other material would be acquired from a depth of about 6.6 feet (2 meters). Sample-return sites must be picked with great care to maximize scientific return, said Paul Spudis, a planetary geology and remote sensing expert at the Lunar and Planetary Institute in Houston. High-speed rocket sled tests are being used to help shape China's moon sample return initiative. "Scientifically, sample-return has value only if you can relate the rocks you collect to some regional unit whose broad origins are known," Spudis told SPACE.com. Lunar samples must be collected, he said, such that their provenance and relation to a large-scale regional unit can be demonstrated. Examples include samples of the youngest lava flows on the moon or the impact melt sheet of a fresh crater, like Copernicus, Spudis said. "Samples collected from a unit of ambiguous context are much less valuable," Spudis said, "as you don't know exactly what the samples are telling you since you cannot put it into certain regional or global context." Flamsteed P: Some of the youngest lava flows on the moon, possibly younger than 1 billion years. Copernicus floor: Impact melt rocks to date Copernicus impact and determine average crustal column at crater target site. Sinus Aestuum: Dark mantle deposits, regional pyroclastics, deep-origin and possible volatile resources (solar wind hydrogen). China delivering new samples from the moon would be welcome news, said Carlton Allen, a planetary scientist and manager of the Astromaterials Acquisition and Curation Office at NASA's Johnson Space Center in Houston, Texas. "I salute any nation's steps into space, including China's successful landing and roving on the moon," Allen said. "A successful lunar landing is a testament to the skill of scientists, engineers, technicians and planners dedicated to an important and difficult goal," Allen told SPACE.com. "Bringing samples from the moon to Earth is an even more difficult undertaking, and the hallmark of a maturing space program." Extraterrestrial samples are the "ground truth" of exploration, Allen said, solidifying scientific understanding of geologic history and its timescale. "At this point, we have well-documented samples from six Apollo and three [Soviet Union] Luna landings, so additional samples from new locations are always welcome," Allen said. "If the samples are carefully collected on the lunar surface, if they are preserved and protected on Earth, and if they are studied by the best scientists in the best laboratories, these samples will open fresh insights into our moon and its environment."